After a big gain on a gambling table some players let it ride. The markets posted a big gain last week and I would not be taking any chips off the table. If there is a positive conclusion to the trade discussions with China, we could be in for an equally big move next week. The keyword in that sentence is "could." If the meeting turned into a trade disaster, that big move could be a retest of the lows. However, investors are more than likely tired of selling. 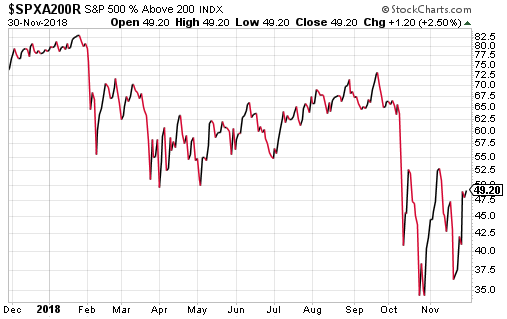 We had two dips to the 10% correction level on the S&P and two major rebounds. Without a trade disaster, I am expecting the market to move higher. There may be some volatility, but the current trend could continue. The reason for my bias is that we have had the China cloud hanging over the market all year. Traders are tired of it and any conclusion that is not a disaster could be seen as a positive event. If we did get some sort of deal that avoided new or higher tariffs, that should be seen as a success. As you would expect with a 1,250-point Dow gain and 127 points on the S&P, all the internals and indicators turned positive. 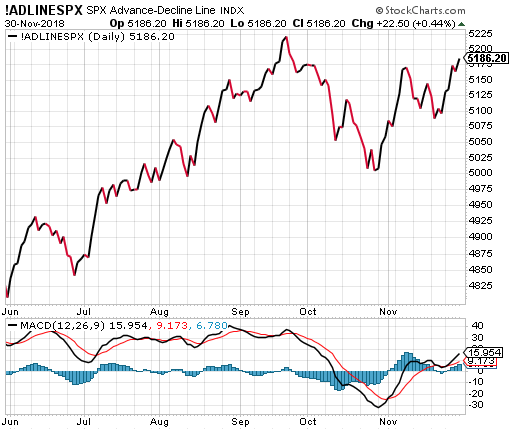 The A/D line on the S&P is almost back to new highs. The percentage of S&P stocks over their 50-day average rocketed from 29% to 56.8%. That is a huge move in one week. The percentage over their 200-day average rose from 37% to 49%. This movement is a little slower because the average is longer. Not all the news was good. 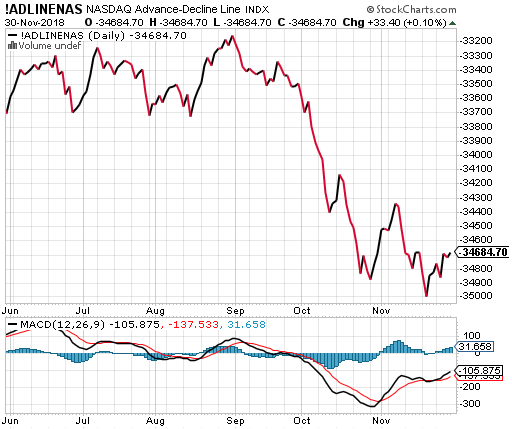 The Nasdaq gained nearly 400 points but the A/D line barely moved. This was the generals leading again but the troops were not following. The big cap tech stocks were on fire because they were the most oversold. Shorts were racing to cover but the rank and file stocks in the sector were barely moving. 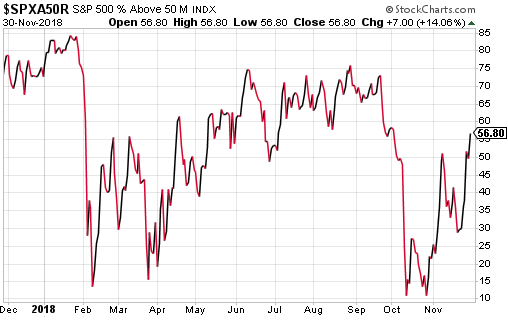 If we could get some additional positive market breadth on the Nasdaq the rally should accelerate. There is only so much the top 15 stocks can do to lift the market. Apple helped significantly with a $13 gain midweek. Shares faded again on Friday. The usual suspects performed as expected. 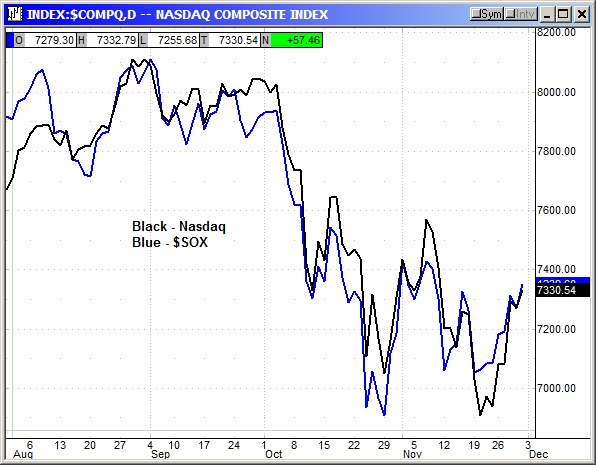 The chip stocks and the Nasdaq moved in perfect correlation with the chips attempting to lead. The FANG stocks were in perfect correlation the prior week with all four at new lows. 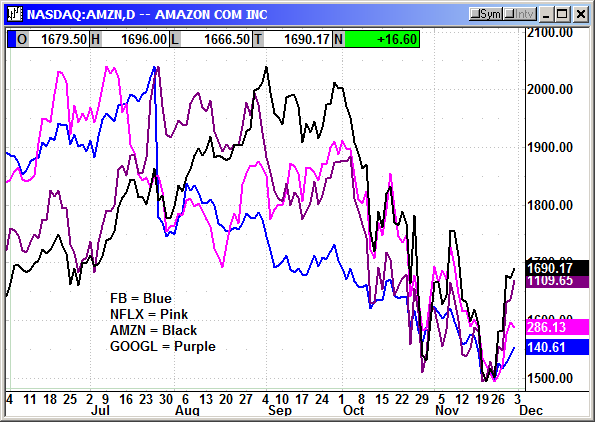 Last week we saw some recovery in Amazon and Google. Facebook continues to be the anchor because of its negative publicity. 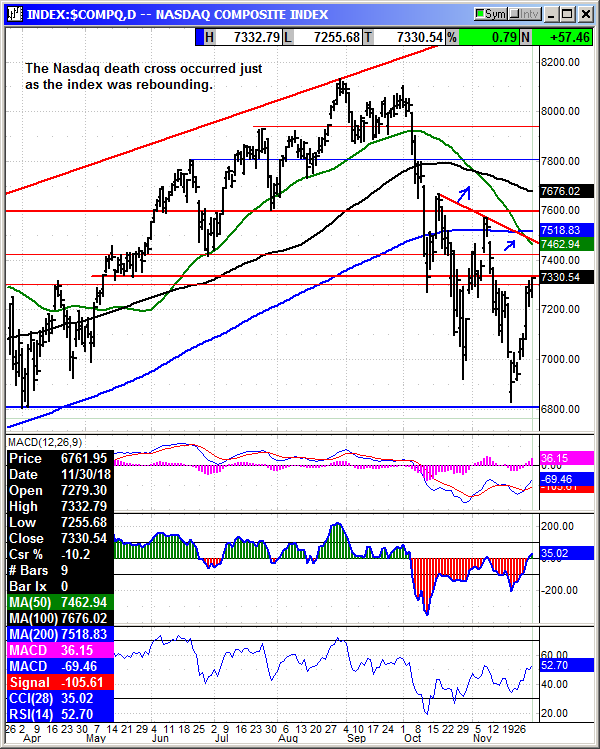 The Nasdaq began rebounding after nearly touching 6,800 and deep into correction territory. The rebound was strong, but it did not stop the death cross from occurring with the 50/200 day. The Nasdaq has a lot of converging resistance around the 7,450 level. Any future gains are probably going to be hard fought unless we get a blowout trade deal. 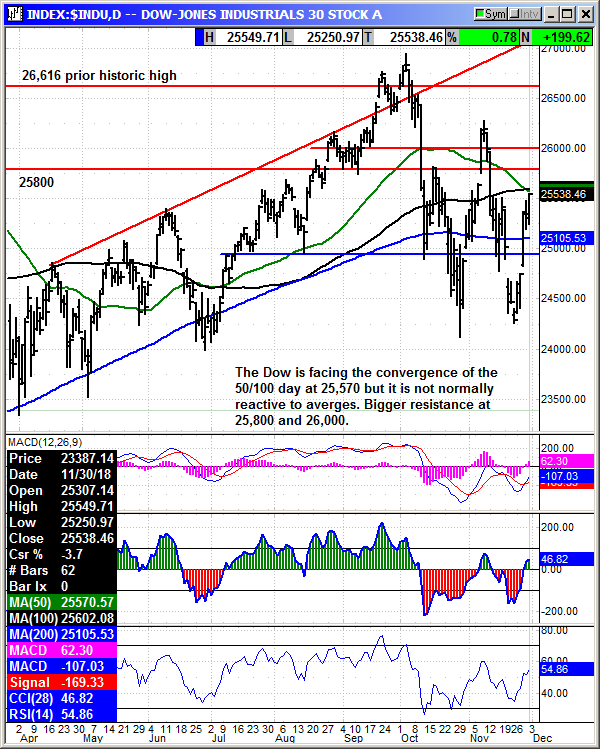 The Dow made it through a lot of the congestive resistance and closed just over 25,500 with a 1,250 gain for the week. That is the definition of short-term overbought but overall the market is still oversold. The index has resistance at 25,570, 25,800 and 26,000. 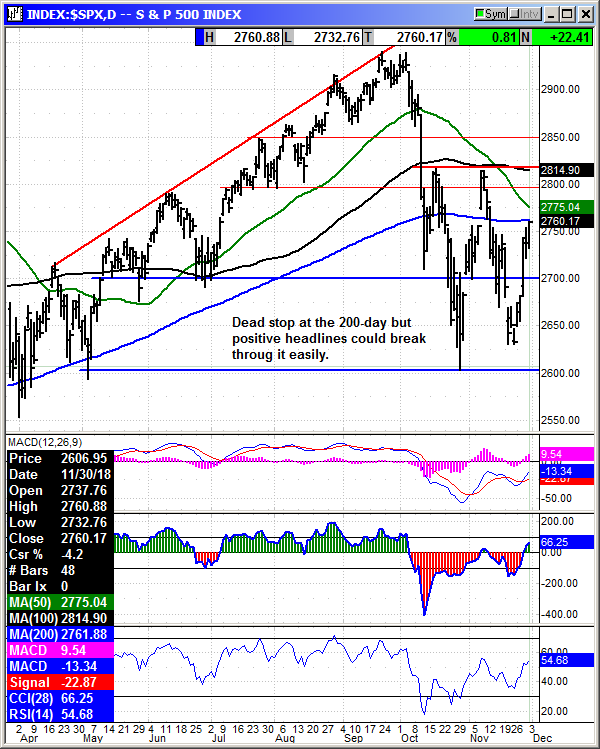 The S&P came to a dead stop at the 200-day on Friday. Any positive headlines should be able to overcome this resistance. The next battle will be at 2,815 and the November high. 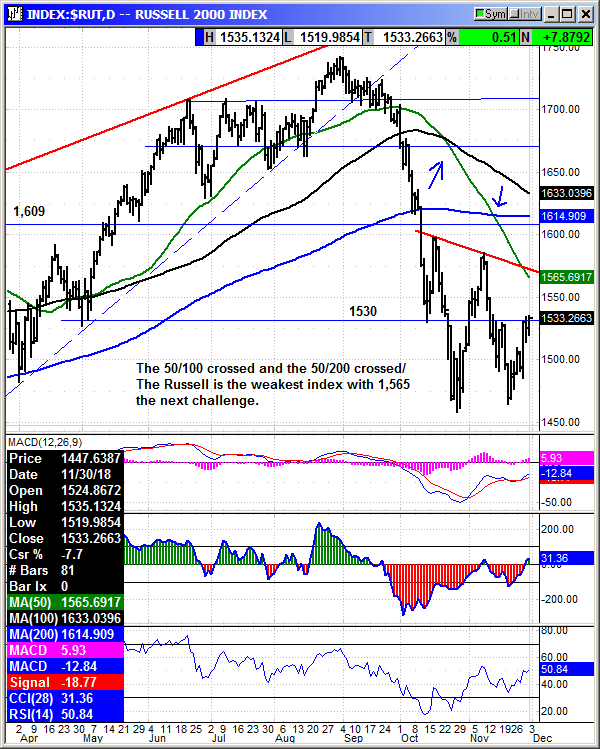 The Russell remains the weakest index but the potential for a halt in rate hikes should be positive for the small caps. The challenge today is that money is flowing back into large caps because of their tariff sensitivity and their oversold conditions. Once they return to fairly priced, the Russell will see rotation back into small caps. The market is at the mercy of the trade negotiations. Negative headlines could kill the currently bullish sentiment and throw us back into the quicksands of volatility. I would ride any rally higher but keep your finger on the exit trigger in case a sell the news event appears.